The first half is somewhat reminiscent of Slumdog Millionaire in that it focuses on the plight of a 5 year old boy from a poor rural family in India. He and his older brother, whom he adores, spend their days jumping freight trains to steal coal, then turn over their booty to their hard working mom. It’s not much of a spoiler to disclose that the boy gets lost, and without cell phones, or even phones, or even a correct town name or name of his mother other than mum, there’s no chance he will be found. Stuck in a child’s prison (aka an “orphanage”), he ends up being adopted by a family in Australia, and the rest I will not tell here. The actor playing the young boy is amazing, and the scenes of beauty (at first, by his home) and then chaos (in Calcutta) and danger at every turn are amazing. It got a little slow for me when 20 years go by and the boy is now living a normal life in Tasmania (more amazing scenery by the coast). It picks up at the end, and what an ending. Dev Patel as the grown up boy, and Rooney Mara as his love interest, are both very good. Nicole Kidman as his adoptive mother I thought was a little overly dramatic. Very cool photos during the credits of the actual boy/man whose story the movie is based on. Highly recommended for ALL ages. I liked this as well and for many of the reasons that Bill articulated. While this shows great beauty in India it also shows tremendous poverty and the incredibly tough life the poor have. 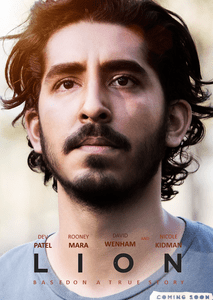 As Bill states, both actors playing Saroo are excellent (Dev Patel starred in Slumdog Millionaire also). A very moving ending and definitely stay during the closing credits. Thanks Bill , adding this to watch list during holidays. By the way you need to watch Dangal , It is releasing tomorrow in the US …Would like to see your review!